The subject line really says it all - I'm interested in what y'all carry in your backcountry first aid kits. I saw a very brief discussion on TC3 and trauma (in relation to the Dark Angel kit HPG is carrying), so I was thinking expanding on this a bit. If my search skills are crappy, I'd love a link to a thread where y'all discussed this! Like I said, I'm curious to see what y'all are carrying. If y'all have any critics to what I'm carrying (maybe something I'm missing, or an event I may not have considered), I'd love to hear it. This isn't really set up as large group kit, or to take care of multiple shootings - its more of a 1-3 day kit. I live in the Southeast by the Great Smokey Mountains, so I'm not sure how well what I do may apply to other areas (for instance - I don't have a snake bite kit, mostly because the likelihood of running into a Copperhead or Timber Rattlesnake is ridiculously small and rarely severe). Look forward to seeing what y'all have! That's pretty much my kit as well, though I do also carry a syringe and a mirror in case I get something in my eyes (or for wound irrigation). FWIW, if you get a chance, check out the HPG tool wrap as the foundation of your FAK--much better than the "yard sale" that can happen when you're tearing into an overstuffed pouch. Only additions I'd make would be a SAM splint and some coflex/ vet wrap. I know you can improvise a splint but the SAM splint makes it so much more efficient and it has plenty of other uses, they also don't weigh much or take up much space either. 1) I double-up on Quick Clots and in addition to a SWAT-T, I also carry either a SOF-T Wide, RATS, or NATO TQ (I have three different trauma kits set up in different load-outs for different trips / missions / environments. 2) I will sometimes carry an Israeli dressing and a Celox-A hemostatic agent syringe, as well. 3) Cric Kit consisting of a scalpel, hemostats (Curved Kelly or Mosquito), IV Drip chamber cut in half (spike can be used to penetrate cricothyroid membrane), and a short endotracheal tube with stylus. 5) Needle thoracentesis kit with chest seal. 6) A couple packages of 2-0 or 3-0 suture (pre-armed), steri-strips, and super glue. 7) Possibly a few other little trauma management items, depending on the trip. 8) A decent variety of "itchy-owie" meds...pain, NSAIDS, antihistamines, decongestants, anaphylaxis, triple antibiotic, sometimes war-wound Rx. What I encounter mostly on the trips I do are small lacerations, abrasions, and ortho injuries. I have the more hard-core trauma stuff along almost as an "anti-Murphy" thing....if I have it with me, Murphy doesn't show up and I don't need it. If I don't have it with me, then he gets an alert signal and delivers some kind of nasty trauma! In addition to the stuff I listed above, I always carry one of these with me when out in the hills, jungle, desert, or mountains...I just posted this link in the Bibliography thread. This handbook is most definitely a worthy addition to one's IFAK / trauma kit. I size my medical gear I carry depending on where we are going, what we are doing, and how many people we are doing it with. My day trip kit is fairly bare bones. When we led multi day trips with a group, I carried a much more comprehensive kit. Two items I've found helpful are an irrigation syringe (https://store.nols.edu/collections/first-aid-supplies/products/irrigation-syringe-12cc) and since I've no training on sutures the contents of an WMI wound pack (https://store.nols.edu/collections/first-aid-supplies/products/wmi-wound-pack). I used both of those two summers ago right after our baby was born. I managed to step on a metal t-post here at the house while wearing minimalist shoes and put a pretty good gash on my foot. It really should have been sutured, but we are an hour and a half round trip to anywhere I can get stitched up, plus the waiting time. I didn't want to leave my wife here with a newborn, or drag the whole fam damily to sit at urgent care so I just used this kit and everything worked out fine. Sorry for taking a while to get to this. Been out of country for a while. SteamBoat - I've gone back and forth on carrying a SAM splint. What are some other uses you've found for it? [/URL] I'm not sure how that compares to what you recommended, but I know the reputation of WMI so I'll look into replacing it with that one. Thanks for the heads up! Woze - I'll have to look up that WMI wound pack. I really need to get some super glue and steristrips to keep in there, but never seem to remember to do so when I'm at the store. For more minor cuts, it is hard to beat super glue, especially if I you irrigate it first (something you pointed out I'm missing!). As always, thanks for input and for showing me some areas I've overlooked! SWAT-T TQ - not as good as a SOF-T or similiar, but a good middle ground that addresses the low probability of needing one. Plus the SWAT-T can also be used as a compression bandage and a bunch of firestarter. Large Silk Bandana - in safety orange. signalling, wound packing, binding sprains. Not sterile, but clean and sealed in a bag. Deep laceration kit - based on the WMI kit Wose references except I finally started making my own. These kits contain alcohol swabs, bacitracin, steri-strips (NOT butterfly bandages), and transparent thin film dressing. These kits are great. Irrigate the heck out of the cut and then patch it up. I've actually used these at home on facial cuts on my daughters because I'm going to do a better job repairing a cut so it doesn't leave a scar than the emergency room is. GOOD tweezers. If you live in cactus country, indispensable. The reference manual is something that I have carried religiously for years. I believe in them, but they weigh between 6 and 8 ounces and I haven't once used one in the field over the course of years. Finally stopped carrying one. I think the right answer here is a diagnostic decision tree app on a backcountry device. I know that quite good ones exist aimed towards overseas travelers, but I haven't done enough research to figure out and acquire one. Also in addition to the "stuff", proper training has to be mentioned. What I have is TCCC based trauma training, periodic CPR refreshers (probably worthless), plus NOLS Wilderness First Aid. And all of my BSA training. It's about time for me to get a refresher on both WFA and TCCC. If I had the time, I'd get and maintain my WFR certification. Just goes to show what happens when you unpack and consider your kit -- after noting my lack of wound packing and sprain control, I added a large silk bandana to my first aid kit. Not as good as an ace wrap, not as good as a sterile gauze roll, but can cover both bases OK and because it's safety orange, can signal with it too. I also took note of the blister issue. Never a problem for me, but was a big deal last time I took kids out. I added several tegaderm bandages. 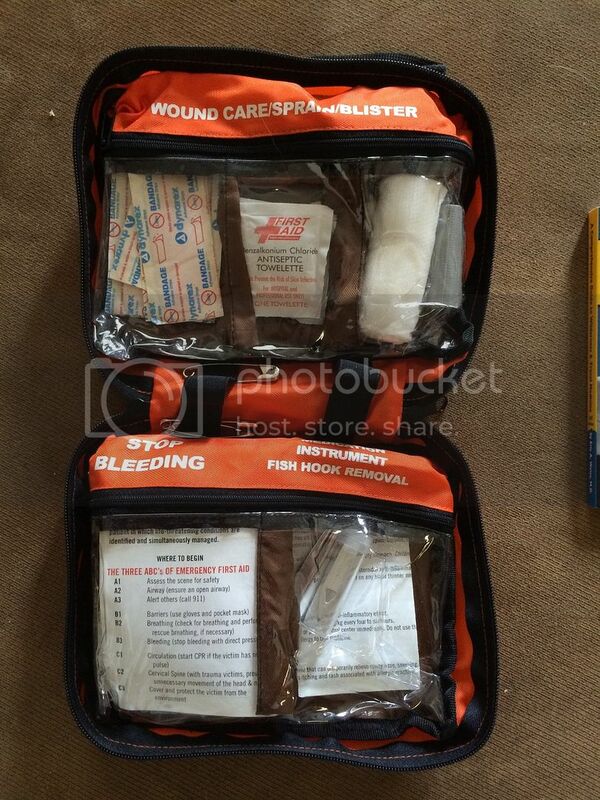 They're the same ones as in the deep wound kit, except smaller. I don't have any experience with them for blisters, but I know that moleskin is worthless and those clear breathable adhesive bandages seem to stay on VERY well with no extra thickness. When I went to buy more at the store I discovered that blisters is one of the stated uses. Adding both of these items increased my FAK weight by one ounce. Not bad at all for the additional capability. I agree that moleskin is useless, i've had trouble keeping tegaderm in place. I've had better luck with Gorilla brand duct tape for hot spots. I wrap it around my trekking poles, and keep a small leatherman tool that has scissors in the Kit Bag so i don't have to open my pack to deal with a hot spot. Dealing with this promptly prevents a blister from forming most of the time. The Backpacking Light crowd swears by Leukotape but I've not tried it. Leukotape is a staple in my FAK--I usually have a yard or so wrapped around a playing card so it takes up minimal space. Its pliability makes it tough to cut, though--probably a job for shears. (Hypafix might be easier to work with, but I've not tried it yet.) If you put in a little time with Leukotape, though--e.g cleaning your skin with an alcohol swab before applying, rounding the edges of the tape if you're taping your heels (so your socks won't catch it), and using two strips if you're taping your toes (one on the ventral side, then the other over the top to lock it in)--it should last for days. Along the same lines as tape, I also carry Coban wrap. An alternative is McNett Camo Form. It's stretches just a bit, adheres to itself, and can be wrapped to support joints or used with splints for sprains and fractures. The Camo Form version is also great to camouflage parts of weapons, or as a wrap to secure loose straps and the like. At work, we use Mastisol, tincture of benzoin, or skin prep pads to help adhesives (tegaderm, steristrips, etc.) stick. It makes the skin surface tacky and helps them stay on. Put it on and let it dry. It's funny, I always had good luck with moleskin. I probably never put in the miles you guys do. I've heard about duct tape/gorilla tape working well too. I didn't know about the tegaderm, that's a good tip. I know that Coban has gained a huge following in the First Aid community in recent years. I'm not currently carrying it due to bulk. Something else I discovered recently is that if you have it in your pack for a year or two without using, it will probably be unusable (or very close) when you need it. Tincture of benzoin is found in the WMI wound closure kits to be applied before the tegaderm. Gotta make sure I got some into my homemade kits. Honestly I don't remember. Duct tape works pretty doggone well, but I've had issues with it staying applied. Over the years the Red Cross First Aid/CPR/AED program has been progressively dumbed down. It now exists primarily to 1) Allow employers to check a box saying they have provided training 2) make money for the Red Cross and 3) Maybe get people to call 911 instead of stand there with their mouth agape. Everything I've done through NOLS/WMI has been first rate. 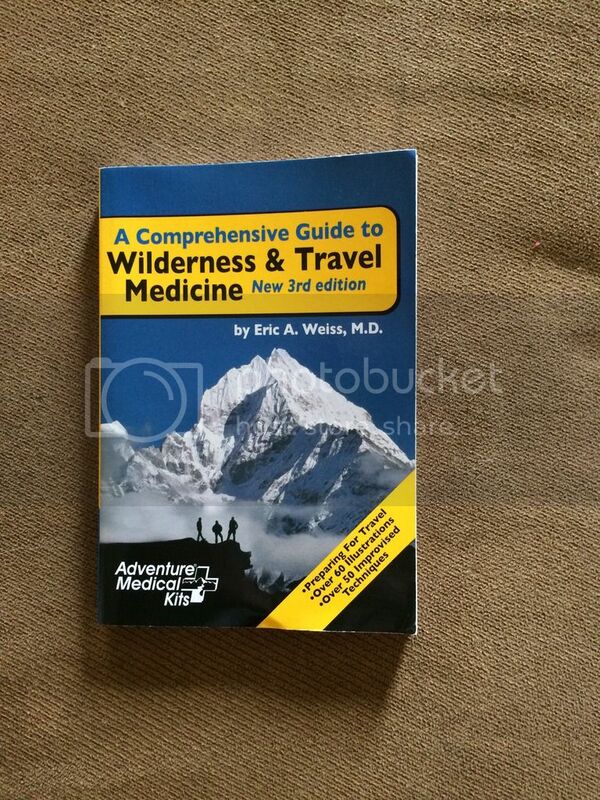 They define "Wilderness" as anywhere more than an hour from definitive medical care. Under certain weather conditions, my house would fit that description. During a large natural disaster, downtown in a major city could fit that description. I've previously been certified in the NHTSA First Responder curriculum. Once the baby gets a little older and I can be away for a week, I'd really love to get my NOLS WIlderness First Responder ticket. Keeping that cert up, along with some occasional training specific to gunshot truama and the like would pretty much cover all the bases for me. GoKartz- Outside of splinting I can think of fire windscreen, funnel, various automotive repairs as, equipment repair etc... With some imagination I'm sure you can come up with many many more. I see it as one of those things that while you can improvise other things to use in it's place, nothing you can carry in a pack will do as good of a job as this for it's intended purpose. And it will fill many other roles that it's form ability and stiffness will be a great benefit. The light came on whilr going through my WFR cert of just how useful they are. They are added weight and bulk but it's earned a place in my Ute (top pocket). Another alternative that's usually cheaper than Coban is Vet-wrap. It's the exact same stuff but typically a bit cheaper, probably because it's not marketed for human use. Wilderness Medicine of Utah is another great resource to get your WFR. And may be more attainable than NOLS just because I know they offer programs through various community colleges. NOLS might offer the same thing I just haven't seen it anywhere. Coban has pressure-sensitive adhesive, same as sticky-backed sandpaper. As such, if its been mashed in a pack, good luck getting it apart. I carry it in a aid back but I stress to troops I train to never, ever put that stuff in an IFAK to use as a pressure wrap. A fix for the bulkiness issue is to wrap a length of it around a Sharpie and carry it that way. Certainly, if there is risk of a lot of swelling, Coban or similar is not the best. However, if needing to hold a splint in place (allowing for proper circulation) or for joint support (as in sports-taping) it works pretty well. Just be cognizant of the left and right limits of its effective and safe usage. Quick & possibly useful addition if I may... For hotspots and blisters I carry a small piece of hard soap. When a hotspot appears, or even after fixing a blister you rub some of the soap onto your sock (over injured area), which lubricates the area thereby mitigating further friction damage.